I received the smaller LEDs today and got them installed. I promised you a couple of pictures of my latest project. This is the first time I have attempted such a detailed interior and the lights really show it off. Thanks for suggesting the small chip LEDs. They worked great! 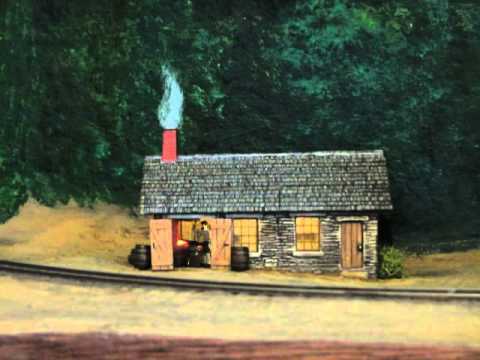 It's amazing what is available in HO scale if you dig for it! Most of the work benches and basic large clutter came from Rusty Rails (unpainted castings) and the intricate details (tools, gears, fan belts, etc.) came from Vectorcut laser cut wood. The structure is scratch-built from my imagination. The LEDs really set it off and let the details show. Thanks again for your help! Attached is photo on my layout. Utilized one of your universal four 1.8mm LED harness to light up a Peco inspection pit. Required drilling holes in side of pit, removing excess layout base material, then running lead wire under layout to DCC buss wires. The lights sure added some dimension to the passenger car RIP track. 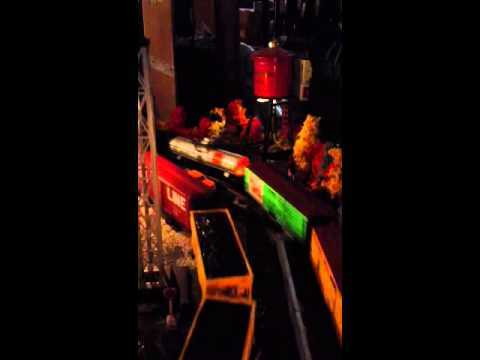 Innovative use of LEDs to replace troublesome regular lamps in a K-line O-scale bay window caboose. 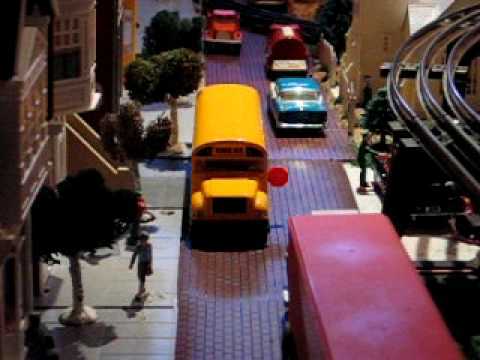 Also eliminated the never-ending problem of the lights flickering as the car passes inevitable dead spots in the track. Building from the Fall layout at historic Edgerton Model Railroad Room, Rochester, NY. Cleaned and repainted, new windows, first and second floor interiors scratch built, sign designed and printed, lighted with Evan Design 5-mm's inside, 1.8-mm's on the sign. 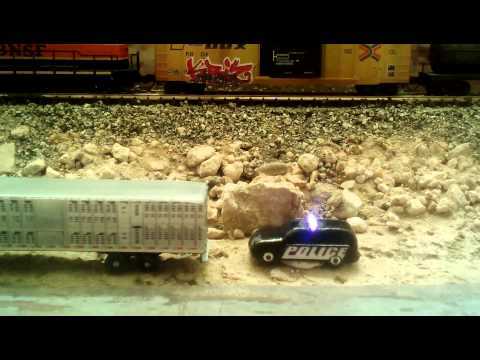 Here are my 5mm warm and 3mm cool LEDs used as headlights on American Flyer locomotives. The steam locomotive has the 5mm warm LED. The American Flyer Baldwin Diesel has the 3mm cool LED used as headlights. These are great! All you have to do is mount the light behind the existing lenses and hook them up to the motor. Presto you have BRIGHT headlights even at slow speeds! Welders working on a boiler inthe garage in the train yard. I also have a switched overhead garage light inside the workshop. This stuff is so cool. O-gauge freight station made by someone else, cleaned up and lighted with Evan Design LED's. Keith, it's a great kit!! Shelly- great feedback and the flicker unit worked out great. to enable the flicker unit to go in that pan!! The Smithy is a great character fig...whoever sculpted him- kudos!! Just received my 2nd order from you and installed 4 flashing LEDs on my model bridge in HO scale. My small n layout with your [Evan Designs] LEDs in it. Finally got to the lighting project. Was able to install ï¿½headlightsï¿½ in two 1/29 model pickup trucks. They were built by different manufacturers so one was a relative cakewalk while the other was not so easy. Got both done OK though. And I got the welding lights installed as well. LED marker lights on Polar Express observation car. Here's a short video of the switcher moving the crane. It's moving faster than I would normally do only to make the file size smaller. My blacksmith shop with a Fire LED kit for the forge and a warm white LED to light the interior. "My MP15, look really nice on my HO layout!" Just a note to tell you how pleased I am with your LED welding kit. Thanks--great performance and a very affordable price! This was my first experience with your product line, and I was pleased I selected your kit for my modeling needs when I browsed Walther's on-line catalog. 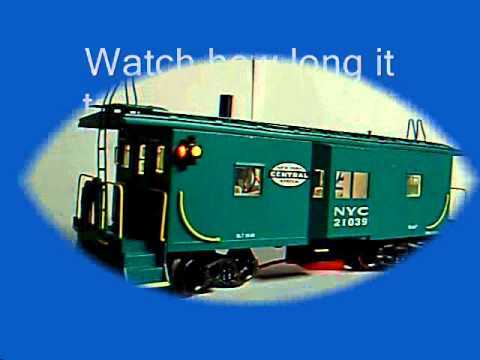 My O-gauge Port of New York & New Jersey Railroad features a full-service shipyard (The New York Ship Repair & Drydock Company. You can check it out in the article I wrote and illustrated in the February 2012 issue of Classic Toy Trains magazine.) I have several welding scenes, and they were in need of appropriate lighting. I have tried other products on the market, but they are more expensive and conventional lighting ultimately burns out and is difficult to replace in inaccessible areas. Check out this welder on the left--a low-resolution image. The welding figures are by Woodland Scenics with a Lionel switch engine and Arttista figure completing the scene. I removed the blue LED, because it was too intense only 20 inches from the edge of my layout. Your suggestion to use a tuft of a cotton ball worked very well--you can't distinguish what it is, but it masks the LEDs and creates a smoke-like effect. It's especially dramatic "at night." It was more difficult for me to take this photograph as I really had to stretch across the layout to take a time exposure of a welder at work on the steamer Lady Di in drydock. The blue light appears too intense in the photo, but as this scene is four feet from where the viewer stands, the effect works well. Again, a tuft from a cotton ball helps to dim the blue light. I may add a bit more to dim the blue LED some more. "As promised have attached two Department 56 pieces that I adapted your LEDs to. In addition to the head lights on the engine, the cars also had LEDs however the pictures don't really show the full effect. The houses are replicas of their larger houses and intended as Christmas tree ornaments. A few years ago I did a similar display using 3v, 6v and 12v lites along with several AC adapters. Needless to say it was a nightmare. Your LEDs resolved those problems resulting in a well lit and easily managed display. I also adapted lights to other D56 items which are not lit - thus enhancing the piece. Members of my club were impressed and have indicated they will also be doing similar projects in their displays in the future. Bottom line your Leds have provided another lighting source (i.e.) spotlights to enhance pieces in ones display. "I finished this last week... just didn't get around to take a vid of it (enclosed). WW interior lights to go with the original incandescent, 2 green markers and a red EOT. Your blue bulbs just arrived. Going to be a cool project. Painted them just now, but have to wait for some decals to arrive before it's finished. Police with head lights and light bar. to be able to hook up leds etc. directly to DCC track power. do not have a home layout so we must be able to use DCC track power. Once again, many thanks. I am sure we will be taking advantage of Evans designs in the near future." I purchased a 10-pack of your 3mm universal LEDs for my passenger train about three weeks ago. As soon as they came in, I ran down to the train club and had them installed in about 1 1/2 hours. I put two LEDs per car, minus the ACF 70'. (it was donated to our club, which is CB&W, or Chesapeake Bay Railroaders). (although we need more building and street lights to make this look good). "This project started out as just purchasing an Athearn Genesis Challenger #3985 (I always wanted one; never got the old Bowser kit assembled). ACF 70', Pullman 8-1-2, UP Gray 8-1-2, UP Gray 10-1-2, UP Gray 6-3, and UP Gray Solarium Observation Lounge." 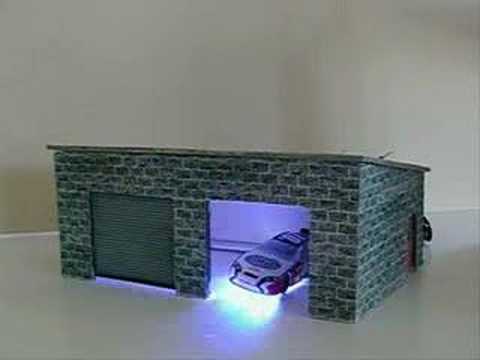 Welding LEDs show up great in this scale model garage. in our control cabs and a photo of our turntable." Thank you to Millhouse Turntables for these great pictures! That is one fantastic turntable! "I wanted to show you how my last project came out. I modified a PW Lionel 2671W tender to match my 681 turbine. I made custom handrails from 726 boiler rails and then added my [Evan Designs] LED backup lights."